Ah yes, Zankou. The cool thing about Eagle Rock is that if you go west or east on Colorado, you can get to a Zankou!! A lot has been already written up on Zankou and their amazing Garlic Sauce, so rather than add more to this topic, I figured I'd just go and eat everything on their menu (not in one sitting, of course) and do a photo-montage. But the sad thing is that you can only find the kabobs and sujuk at the Hollywood location Zankou on Sunset (as far as I am aware of). So, even though it's way off-Colorado, I still needed to get a pic of the sujuk at least. Located in an Art Deco landmark on Colorado Blvd in Eagle Rock, is the second location of Coffee Table cafe (The first being in Los Feliz on Rowena). It's open for Breakfast, Lunch and Dinner - but that isn't the subject of this particular post. I went over to Coffee Table one evening because it was damn hot and I wanted to be in an air conditioned space to read and have some coffee and dessert. Coffee Table fit the bill. 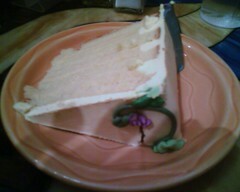 I was surprised to see that they now carry cakes from Sweet Lady Jane!! For those with a sweet tooth, you know what I'm talking about. Sweet Lady Jane is that fine dessert joint on Melrose that is known for making wedding cakes for celebrities. This slice is the Dulce de Leche. I'll be sure to go back and try some more. And by the way, Coffee Table can get you whole Sweet Lady Jane cakes with 48 hour notice. It's great that I don't have to trek all the way to Hollywood to get some of that Sweet Lady Jane! !